Leadership Jefferson City has been a vital program at the Chamber for more than 30 years. Over 900 people have graduated from this program and gone on to be active leaders within our community. 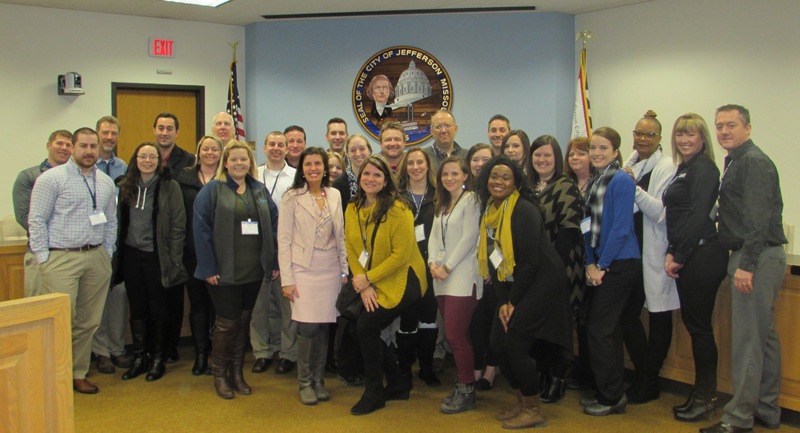 Leadership Jefferson City is designed to identify and motivate emerging leaders, and to develop their potential for community leadership roles by exposing them to the opportunities, realities and challenges of the community. The topics of the eleven sessions included team building retreat with the history of Jefferson City, arts & recreation, diversity, education, health & wellness, industry, local government, media, state government, technology and volunteerism. The applications are available in November and a Steering Committee will review the applications and select the participants in December. Only 30 people are selected to participate in this six month program. Sessions start in January and run through June. For more information, please call Dana Struemph, 638-3589. To be on the mailing list for the next class, contact danastruemph@jcchamber.org. Welcome Leadership Jefferson City Class of 2019! Kayla Arnold, Digital Media Specialist; Leslie Backstrom, The Architects Alliance, Inc.; Justin Bolten, Nabholz Construction Services; Daniel Brenneke, Midwest Block & Brick, Inc.; Pete Brightwell, Scholastic Inc.; Deb Buschman, Hollon Family Chiropractic; Gary Campbell, City of Jefferson; Mark Coe, Capitol Plaza Hotel & Convention Center; Susan Cook-Williams, River City Habitat for Humanity; Chris Ebright, N.H. Scheppers Distributing Company; Logan Gratz, Gratz Real Estate & Auctioneering; Doug Hagenhoff, Hawthorn Bank; Mat Heinrich, Central Bank; Meghan Henderson, Missouri Hospital Association; Carolyn Jackson, SSM Health St. Mary's Hospital; Whitney Jacobs, Modine Manufacturing; Aubrey Krcmar, Ameren Missouri; Rachel Patterson, LPN, Jefferson City Manor Care Center; Rebecca Peters, Align Chiropractic Clinic, LLC; Leann Porrello, City of Jefferson; Sarah Rau, Carson & Coil, PC; Austin Rippeto, Jefferson City Convention and Visitors Bureau, Inc.; Tiffany Rutledge, Capital Region Medical Center; Kelsey Schrimpf, Missouri Valley Big Brothers Big Sisters; Jessica Sportsman, Jefferson Bank of Missouri; Travis Stephens, Brown Printing, Inc.; Stefani Thompson, Central Missouri Community Action; Kristal White, Little Explorers Discovery Center; Ronna Wilson, Legends Bank. "I am beyond thrilled that I was chosen to participate in Leadership Jefferson City 2018! As a transplant to the Jefferson City community, I learned so many amazing things about our community. I also have made some of the greatest friendships/connections with fellow classmates. The knowledge you gain about your community is priceless. It was such a great experience, I would recommend it to any individual that aspires to be a part of their community or if you just wish to learn more about your community."